Complex regional pain syndrome (CRPS) is a disabling pain condition poorly understood by medical professionals. Because CRPS is particularly enigmatic, and has significant impact on patient function, researchers have examined psychological processes present among patients with this diagnosis. 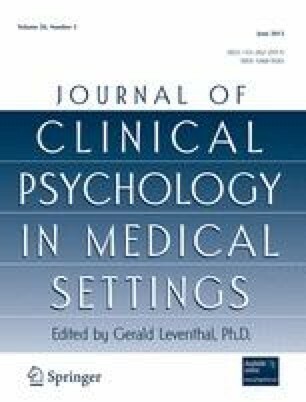 This systematic review examines psychosocial factors associated with CRPS, both predictors and sequelae. Our conclusions are that CRPS is associated with negative outcomes, both psychological (e.g., increased depression and anxiety) and psychosocial (e.g., reduced quality of life, impaired occupational function) in nature. However, research does not reveal support for specific personality or psychopathology predictors of the condition. This manuscript is based on a doctoral dissertation conducted at the University of Iowa. National Institute of Neurological Disorders and Stroke. (2008). NINDS complex regional pain syndrome information page. Retrieved November 3, 2008, from http://www.ninds.nih.gov/disorders/reflex_sympathetic_dystrophy/reflex_sympathetic_dystrophy.htm. Savaş, S., Baloglu, H. H., Ay, G., & Cerçi, S. S. (2008). The effect of sequel symptoms and signs of Complex Regional Pain Syndrome type 1 on upper extremity disability and quality of life [Electronic version]. Rheumatology International. Retrieved November 23, 2008, from http://www.springerlink.com.proxy.lib.uiowa.edu/content/101577/. Verbunt, J. A., Pernot, A. H. F. M., & Smeets, R. J. E. M. (2008). Disability and quality of life in patients with fibromyalgia [Electronic version]. Health and Quality of Life Outcomes, 6, 1–8. Retrieved November 23, 2008, from http://www.hqlo.com/content/6/1/8.